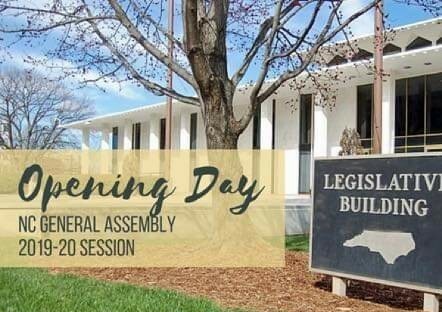 The General Assembly ended the 2018 session on December 27th, 2018. After a short holiday break, newly elected and re-elected members opened the 2019 long session on Wednesday, January 9, 2019, with a visible spirit of excitement and partnership coming into the new year. To learn more about who represents you in the North Carolina General Assembly and Congress see Who Represents Me?. The House re-elected Representative Tim Moore from Cleveland County as Speaker of the House of Representatives. The Senate re-elected Senator Berger from Rockingham County as the Senate Pro Tempore. The House adopted temporary rules of operation under House Resolution 1 and the Senate adopted Permanent Rules under Senate Resolution 1. President Pro Tempore Berger appointed the committee members and chairs for the Senate Committee on Appropriations Education/Higher Education. Chairs are Sen. Deanna Ballard (R-Watauga), and Sen. Jerry Tillman (R-Randolph). Sen. Deanna Ballard (R-Watauga), Sen. Jerry Tillman (R-Randolph) and Sen. Rick Horner (R-Nash) will chair the Senate Committee on Education/Higher Education. Education Chairs in the House have not been announced but it is anticipated these will be finalized and made public later this month. The following members were appointed chairs of the House Committee on Appropriations: Rep. Dean Arp (R-Union), Rep. Bill Brisson (R-Bladen), Rep. Josh Dobson (R-McDowell), Rep. John Faircloth (R-Guilford), Rep. Linda Johnson (R-Cabarrus), Rep. Donny Lambeth (R-Forsyth), Rep. Chuck McGrady (R-Henderson), and Rep. Jason Saine (R-Lincoln). Reps. Johnson, Lambeth, and Saine, were designated senior chairs of the House Committee on Appropriations. Speaker Moore appointed three chairs of the House Committee on Finance: Rep. Julia Howard (R-Davie), Rep. Mitchell Setzer (R-Catawba), and Rep. John Szoka (R-Cumberland). The General Assembly now stands adjourned until Wednesday, January 30, 2019 under the Joint Resolution SJR2. 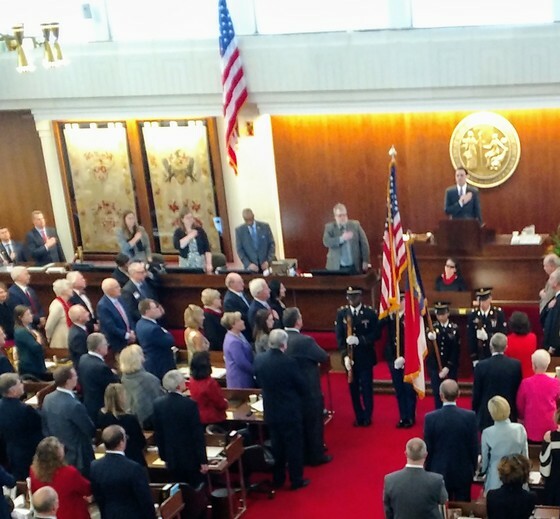 Photo captures the North Carolina House of Representatives on opening day where Law Enforcement Officers were recognized in the House as part of National Law Enforcement Day and the National Anthem was sung by Mary Mikels of Wake County. Each new biennium of the General Assembly, the House and Senate set by rules for each chamber to manage how business will be conducted. The House set temporary rules which cover the following areas. The House members will vote on permanent rules for the 2019-2020 legislative session when they reconvene. The State Board of Education (SBE) held their first meeting of 2019 this week. The agenda and documents from Wednesday's meeting can be found here and Thursday's meeting here. Audio for State Board meetings are accessible at this link. 2018 Short Session link for bills impacting K-12 education.